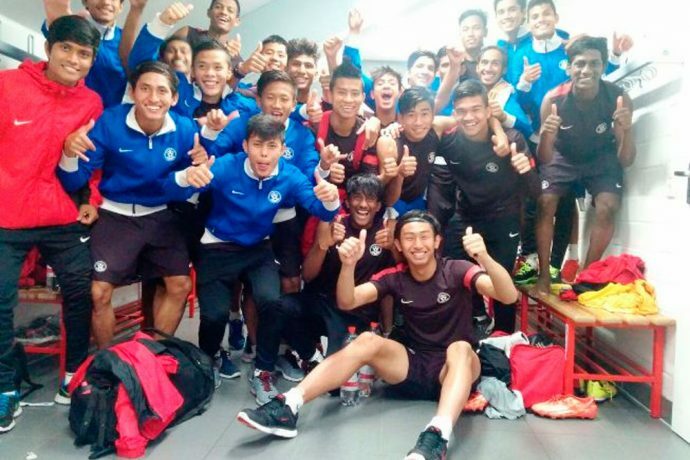 The India U-16 boys shared the spoils with 1. FC Köln U-16s on Wednesday, August 3 night, all thanks to a first-half goal by Joysana Singh and a late penalty by Amarjit Singh in the dying minutes of the game. The Indian boys came back twice from behind against 1. FC Köln, who have conquered the U-17 Bundesliga (West Region) twice in recent history. 1. FC Köln U-16 boys did not need to wait for more to opening the scoreline as they found the back of the net within first five minutes from what was a dubious decision by the official. The referee awarded a spot-kick in the home team’s favour who did no mistake to tap it home calmly. Indian boys were left clueless after the opening goal and 1. FC Köln were enjoying the lion’s share of the possession. The Indian defenders ran a stupendous show to stave the danger, imposed by the Germans, off. Just after the clock crossed the 20-minute mark, India found the back of the net from an immaculate gameplay by the youngsters. Following a brilliant 1-2 between Komal Thatal and Joysana Singh, the later found himself in a favourable position and stole the equaliser, sending the India bench on a delirium. Following the goal, the Indian boys took the control of the game and started to dictate the game till the end of the first half. They almost got their nose in front in the 28th minute but Sanjeev Stalin’s right-footed free kick from the top of the box missed the top corner by a whisker. After the tad break, Indian boys resumed cautiously but they could not avert the danger as 1. FC Köln once again went ahead in the 49th minute. The 1. FC Köln striker received an inch-perfect cross from the right flank and blasted the back of the net leaving no chance for the Indian custodian Dheeraj Singh. Boris Singh probably had the best chance to equalise on the halfway mark. Instead of trying his own luck from close range, Boris tried to pass it to Aman but the 1. FC Köln goalie averted the peril. On the short corner which was taken by Aman Chetri, Boris steered it rightly but the woodwork denied him this time. A late drama unfurled in favour of the Indian boys in the last minute to cancel out a win for the 1. FC Köln boys. Amarjit was tripped down inside the box and the referee didn’t hesitate to award a spot-kick in the away team’s favour. Amarjit stepped up to taking the penalty kick and didn’t let his coach down. From what was supposedly the last kick of the match, India scored against 1. FC Köln, one of the notable clubs in Germany, and not only gathered a draw tonight, but also loads of confidence ahead of the tough schedule awaiting the boys.